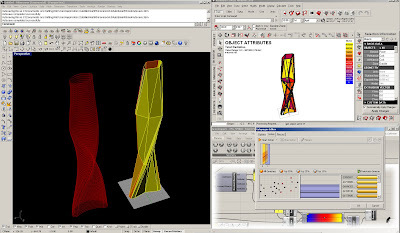 The video shows a snippet of a tower form-finding process using Grasshopper, Galapagos, and Ecotect. Custom Grasshopper components are used to send a tower mass to Ecotect and retrieve information via a DDE connection. Galapagos evaluates the tower analysis results and looks for shapes which have the lowest total radiation. A low-poly shape is used for the purposes of speed in this video.